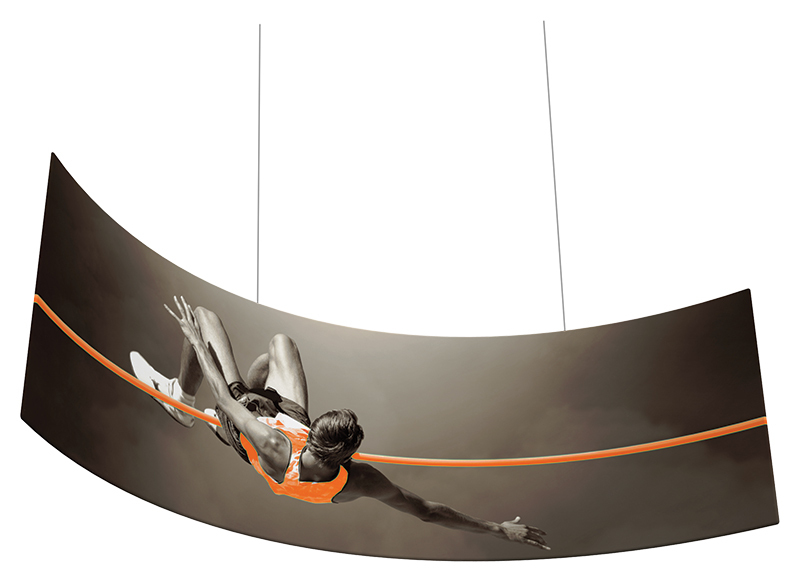 The curve hanging banner offers a simple, curved surface for your graphics and messaging from anywhere on the event floor, and can be single or double-sided. Certified and guaranteed by a licensed structural engineer for use in most tradeshow and convention halls, Formulate™ Master 3D Hanging Structures are constructed from a carefully crafted aluminum tube framework to create a rigid skeleton. The high quality, dye-sublimated fabric graphic is then stretched over it like a pillow case to form a large, smooth, eye-catching sign that can be seen from all over the event. The hardware is easily assembled using a simple, snap button assembly system. Detailed, easy-to-follow set up instructions are included. Note that trade show hall or event rigging labor may be required according to specific venue regulations. 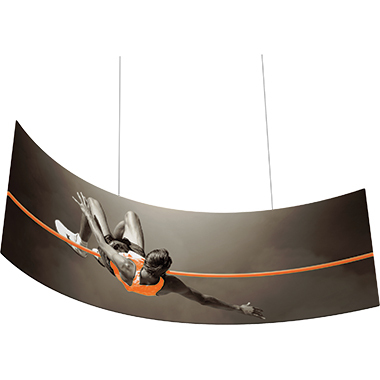 There are several ways to customize your hanging banner display, including, but not limited to: shape, size, double-sided graphics,single-sided, and shipping cases. If you have ideas, questions, or would like a quote, please contact us. Freight cost is calculated upon order confirmation and is the responsibility of the purchaser. To request a shipping cost estimate please contact us. Orders shipped to Canadian addresses are subject to GST/HST, duties. Graphic design services are available at $65 per hour. Call to arrange. Installation & Dismantle Services are available for select cities. This item is manufactured in the U.S.A. Contact us by email or by phone at 1-855-536-3385. Allow at least 10 business days for production and graphics of standard shapes. Rush options may be available, please contact for details.